In the long-awaited digital adaptation of Uwe Rosenberg’s award-winning Patchwork, players patch their way to victory using fabric pieces of assorted sizes, colors, and buttons. The best quilt is the fullest, and whoever can patch up their quilt the most and collect more buttons wins the game – but be resourceful and plan every stitch! Keep an eye on the costs and the time it takes to stitch a patch to be the best patchwork master. Play against quilters from around the world on multiple platforms and compete for the highest rank. Face computer opponents, or stick to a solo game. 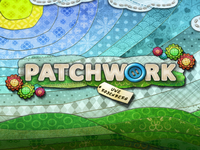 Patch your way to the top in Patchwork!